BIF SBOS Am. GCH DC Can. Ch. Solo is a dream of a dog - very self-confident and outgoing, and he wants to be the center of attention at all times. I could not wait to get this silly beast into the ring! Solo got his registered name because of how our lives were affected by waiting for him to get here! We kept waiting and waiting for Doodle to give him up, re-arranging our daily schedules as we awaited his birth - we ended up having to retrieve him via c-section on day 70 (all this having been at the advice of our vet). Then - with him being a singleton pup - I kept an even closer watch on him in the early days for fear of something going amiss - with one pup there's no room for error! A young Silken, Luna, became his foster sister when he was 6 weeks old so that he would have someone "doggie" to play and interact with. He's pretty hard not to spoil though! The first time he ever entered a ring, he was a completely untrained (for show, anyway) 4 1/2 month old pup at an IABCA show. 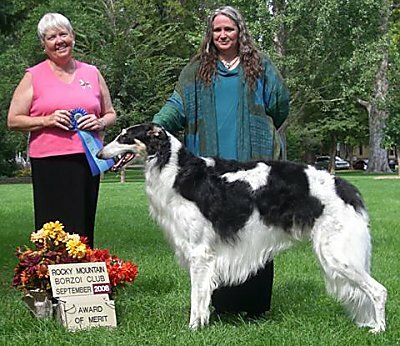 He had just come along for the ride for some travelling experience, and we entered him in one of the shows since it was a Borzoi breeder-judge (John Rowton of Kenai Borzoi). Little Solo acted like a pro and went on to win Best Bred-By Puppy and Best Puppy in Show! 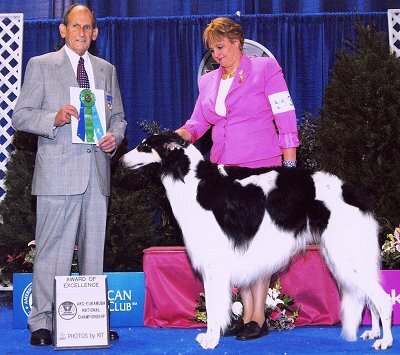 At the 2005 BCOA National Specialty, Solo made the cut in the highly competitive Bred-By-Exhibitor Dog class. At 8 months of age, he was the youngest entry in the class - so we are very proud of him even though he ended up without a ribbon in the end. 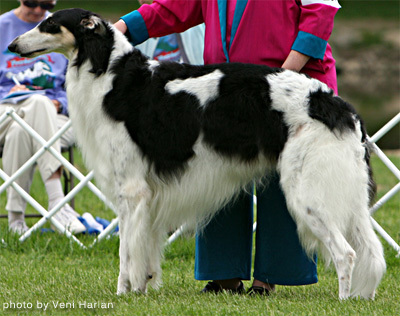 In May 2005, Solo earned his first points towards his AKC championship from the Bred-By class at the Denton KC dog show. He loves to go out and play show dog, and we enjoy showing him off! At his first LGRA meet (October 2005) he won the meet and earned 2 points towards his GRC. At his first ASFA trial, he won the Open Stake, then won the run-off for Best of Breed, and went on to win Best in Field! He finished his ASFA Field Championship title in January 2006, as well as picking up his AKC Junior Courser title in December. 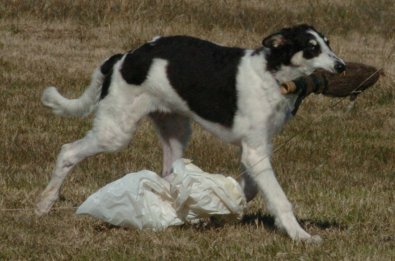 At the 2006 BCOA National Specialty, Solo won the Bred By Exhibitor Dog class. He also had placements in all the field events, taking 4th place in the PowerPaws competition for dogs that competed in all three events (ASFA, LGRA & AKC lure coursing). In August 2006 Solo travelled to Canada with our friend and handler Jill Bell. He finished his Canadian championship in style by winning the Hound Group! 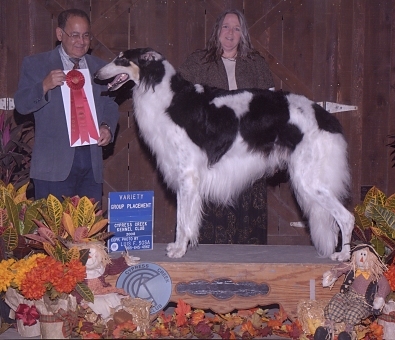 Solo completed the requirements for his AKC championship in November 2006 and began his specials career in 2007 (working around various performance events). 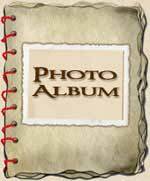 His AKC Field Championship (FC) was completed in April 2008, making him an AKC Dual Champion. An unexpected breek in October culminated in him finishing his Oval Racing Champion title as well. He is a multiple Group winner and placer as well as multiple Specialty AOM winner, and we are very proud of his accomplishments. He has sired two litters for us, the first with Monkee (the "Boogie Babies") and the second with Duri (the "Spells"). 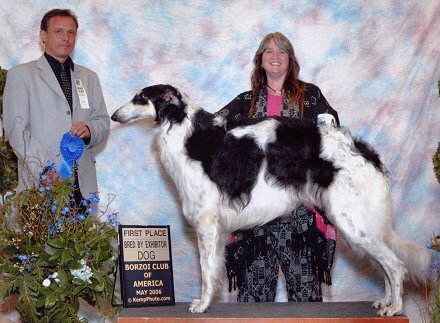 In September 2010, Solo completed the requirements for his AKC Grand Championship, handled to his final points by R. Lynn. 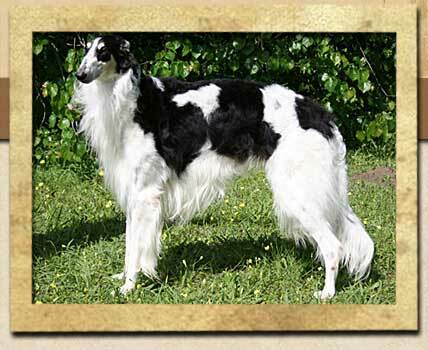 He is the first Dual Champion Borzoi to complete the title!